Researchers at SLAC’s Stanford Institute for Materials and Energy Science and the Stanford Materials Science and Engineering Department discovered what is going on when ferroelectric materials produce an electric voltage when exposed to light. By using the X-ray Pump Probe instrument of SLAC’s Linac Coherent Light Source, the researchers analyzed information from thousands of images to determine the photovoltaic mechanism. Such insight is very useful to researchers hoping to design ferroelectrics with improved photovoltaic properties for use in solar cells and other applications, such as sensors and ultrafast optical switches for data and telecommunications networks. Several possible mechanisms have been proposed, with many open questions still remaining. Now, in research published last week in Physical Review Letters, scientists led by Aaron Lindenberg of SLAC’s Stanford Institute for Materials and Energy Science and the Stanford Materials Science and Engineering Department, along with graduate student Dan Daranciang, have determined first-hand what is going on: Stop-action X-ray snapshots of a ferroelectric nanolayer showed that the height of its basic building block, called a unit cell, contracted in response to bright light and then rebounded to become even longer than it was to begin with. The telling X-ray images were taken at the X-ray Pump Probe instrument of SLAC’s Linac Coherent Light Source (LCLS), which hit the ferroelectric samples with a stunningly rapid one-two punch of violet laser light (40 quadrillionths of a second long) and X-rays (60 quadrillionths of a second long). The researchers analyzed information from thousands of images to determine the photovoltaic mechanism. The fact that ferroelectric materials produce much higher voltages than conventional silicon-based materials makes them an attractive option for making solar cells, Lindenberg said. But their very low light-conversion efficiency has precluded commercial applications. Now that researchers understand the underlying mechanism, he said, they can more effectively create ferroelectric materials that are more suitable for photovoltaic applications. 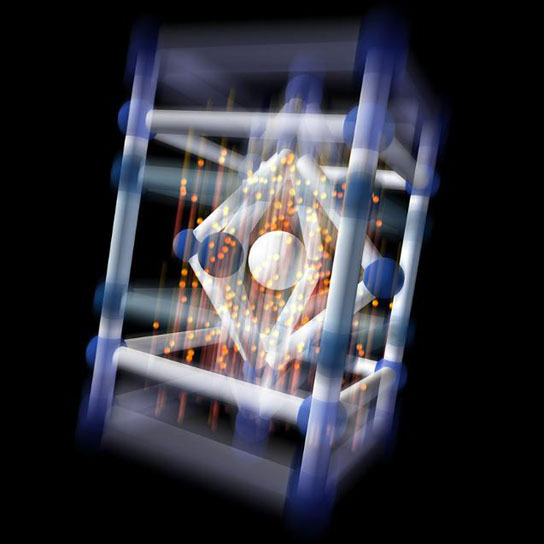 1 Comment on "Researchers Use LCLS to Examine Ferroelectric Materials Exposed to Light"
This is one of many articles that I believe support my multiverse model, in which all matter in the universe is driven/energized by The Big Drag.